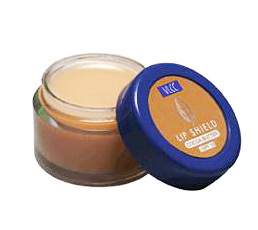 Buy VLCC Lip Shield Cocoa Butter for Soft and Moist Lips. Heals chapped lips. Cocoa Butter and Vitamin E.
This unique Lip Shield enriched with the goodness of Cocoa Butter and Vitamin E, helps heal chapped lips, conditions and keeps them smooth, while protecting them from harmful effects of the sun (SPF-10), wind and cold. Apply liberally and evenly before exposure to sun, Wind or cold. Cocoa Butter, Almond Oil, Lemon and Vitamin E..